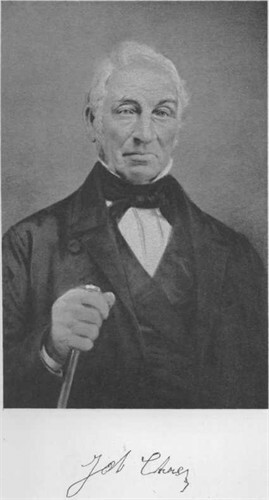 Job Chase (1776 – 1865) was Alex’s cousin eight times removed in the Shaw line. 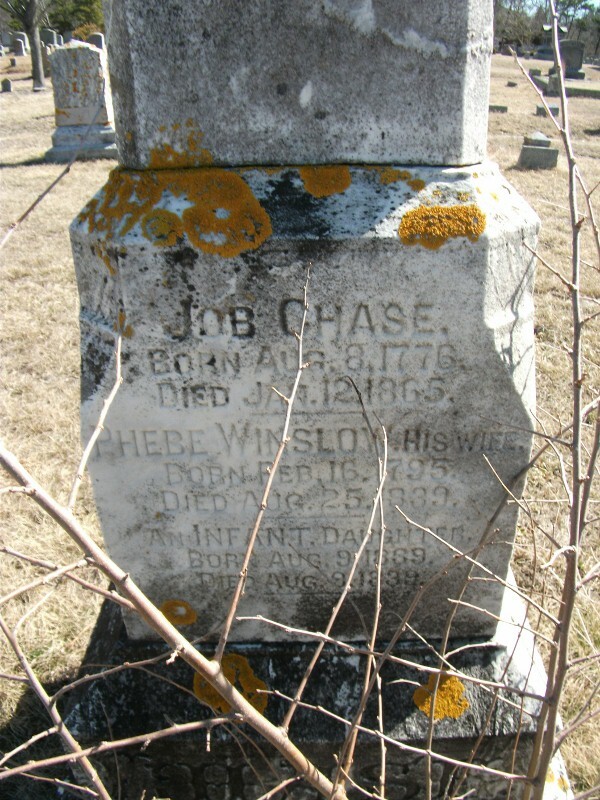 Job Chase was born 8 Aug 1776 in Harwich, Barnstable, Mass; His parents were Job Chase and Hope Sears. His paternal grandparents were William CHASE III and Dorcas BAKER. He married 25 Nov 1796 to Polly Eldredge. Job and Polly had nine children born between 1797 and 1813. After Polly died, he married again 22 Feb 1816 in Brewster, Barnstable, Mass to Phebe Winslow. Job and Phebe had eight more children born between 1817 and 1831, Finally, Job married in 1842 to Eunice Crosby. Job died 12 Jan 1865 in Harwich. Polly Eldredge was born 18 May 1778 in Harwich, Barnstable, Mass. Polly died 26 May 1816 in West Harwich. Phebe Winslow was born 16 Feb 1795 in Brewster, Barnstable, Mass. Her parents were Joseph Winslow (1772 – 1816) and Abigail Snow (1766 – 1844). Phebe died 25 Aug 1839 in Harwich. In the 1850 census, Isaiah and Hannah were farming in Harwich with five children at home. Sear’s wife Anna Knowles’ was list as “Of Orleans” in their marriage intentions. Sears W. (unreadable), Annie S. wife of Rev. W. Willey, Dwight Mission, d.
to read. (From Burt Derick’s book on Dennis Cemetery Inscriptions). Darius’ first wife Mary Louisa Gardner was born 20 Jul 1812 in Bolton, Worcester, Mass. Her parents were Stephen Partridge Gardner (1766 – 1841) and Achsah Moore (1774 – 1837). Darius and Mary had two children Charles (b. 1836) and Elizabeth (b. 1838). I haven’t found a divorce record, but Mary died 24 Oct 1902 in Cambridge, Middlesex, Mass. 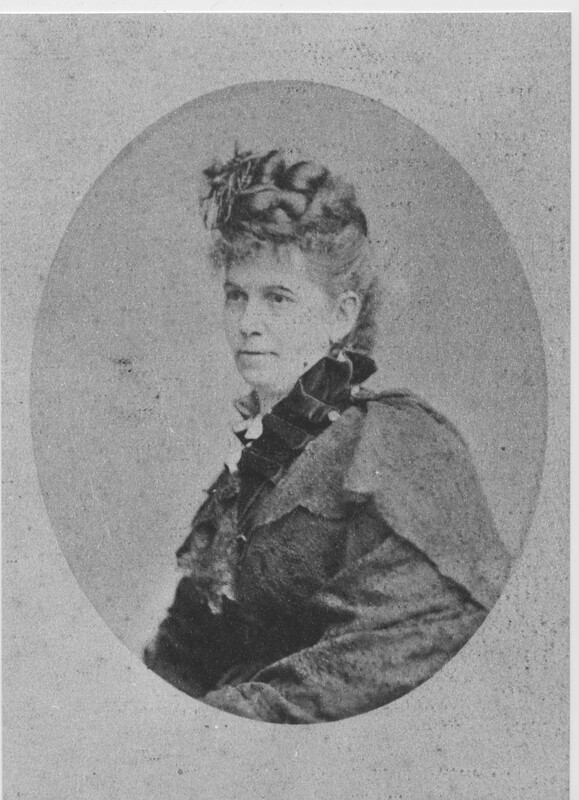 Darius’ second wife Sarah Annie Merryman was born 15 Jan 1838 in Baltimore, Maryland. Her parents were John Buck Merryman (1814 – 1861) and Sarah Baker Ensor (1817 – 1905). Darius and Annie had two children: Lillie (b. 1859) and Darius (b. 1861) Annie died 30 Dec 1910 in Somerville, Middlesex, Mass. Darius was an artist and a restorer of oil paintings. He worked in Boston as a restorer from 1844 and 1848. In 1851 he was living in Philadelphia. Some time during the 1850’s he moved to Charleston, South Carolina where he ran a gallery and worked as a restorer. A register of his gallery from 1857 to 1858 is included in the The Joseph Downs Collection at the Winterhur Library. The 44 page volume includes a list of people who visited the gallery and a list of artists whose works he supposedly exhibited. Also included are remarks that Chase made on the techniques of painting restoration. Here are a few of the paintings Darius restored that are in the collection of the Massachusetts Historical Society. It looks like Darius worked for the society in the 1840’s. John Wentworth. Born at Portsmouth, Jan. 16, 1672. 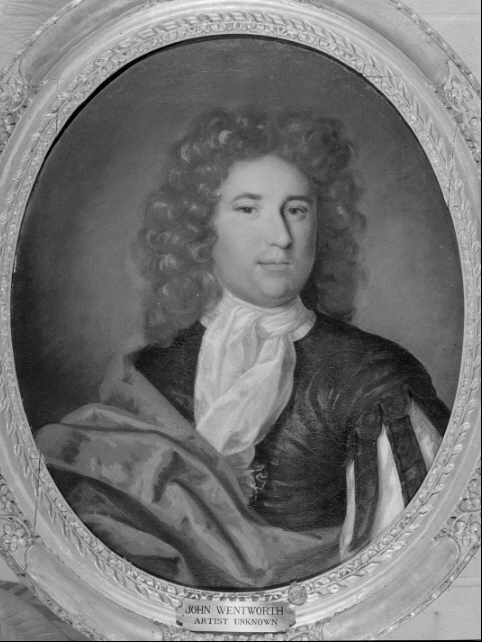 Lieutenant-Governor of the Province of New Hampshire, from 1717 to 1730. Died, Dec. 12, 1730. This painting (25 x 30) was given by Sir John Wentworth, Governor of Nova Scotia, February, 1798. It was restored by Darius Chase, 1845. Rev. 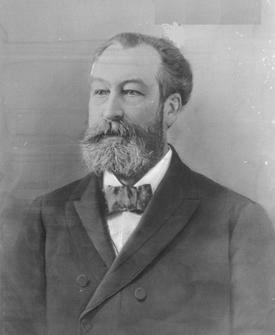 John Wilson, D.D. Born at Windsor, England, 1588. First Minister of Boston. 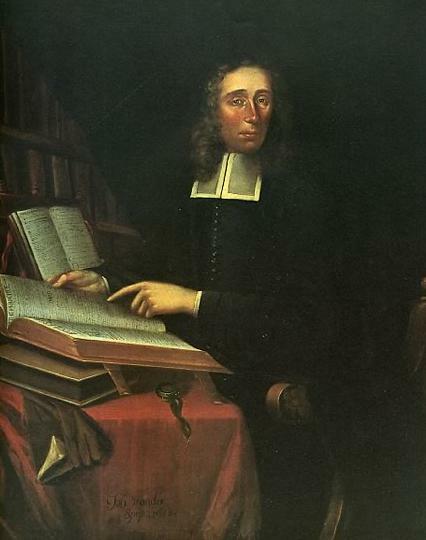 Pastor of the First Church, from 1632 to 1667. Died, Aug. 7, 1667. A supposed (doubtful) original portrait. (25 x 30.) Given by Henry Bromfield, Esq., February, 1798. Restored by Darius Chase, 1845.
by Darius Chase, 1845. Inscribed: ” iCtatis • suae • 49 1688.” ” Joh. Vanderspriet; 1688.” Given by Mr. John Dugan, Jan. 30, 1798. Berkeley, Rev. George. Born at Kilerin, Ireland, March 12, 1684. He was Dean of Derry, and afterwards Bishop of Cloyne. He came to Newport, R. I., in 1729, where he remained two and one half years, when he returned to England. He died at Oxford, England, Jan. 14, 1753. Painted by Smibert, on his passage to Newport, R. I., in 1728. Restored by Darius Chase, 1845. Given by Thomas Wetmore, Esq. Admiral Keppel while on its way as a present to the Stadtholder of Holland, and now belonging to Keppell’s descendant, the Earl of Albemarle, Quiddenham Park, Norfolk. (60 x 96.) Given by Alexander Duncan, Esq., Sept. 10, 1874. 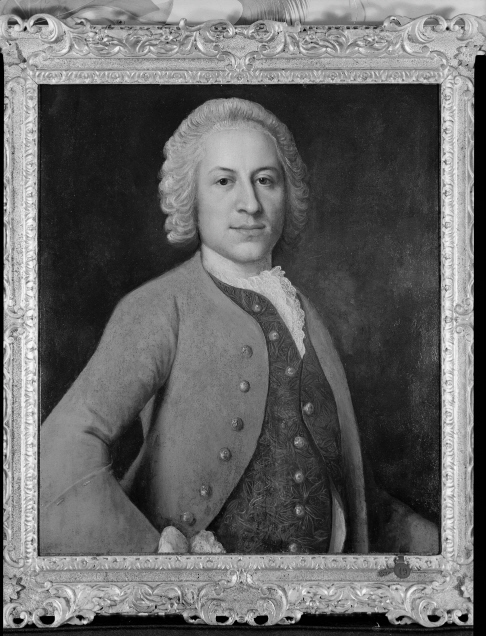 The first portrait by Peale is in possession of Charles S. Ogden, Esq., of Philadelphia. Painted by Joseph Wright, Philadelphia, 1784. Restored by Darius Chase, 1845. (30 x 37.) Given by Israel Thorndike, Dec. 31, 1835. 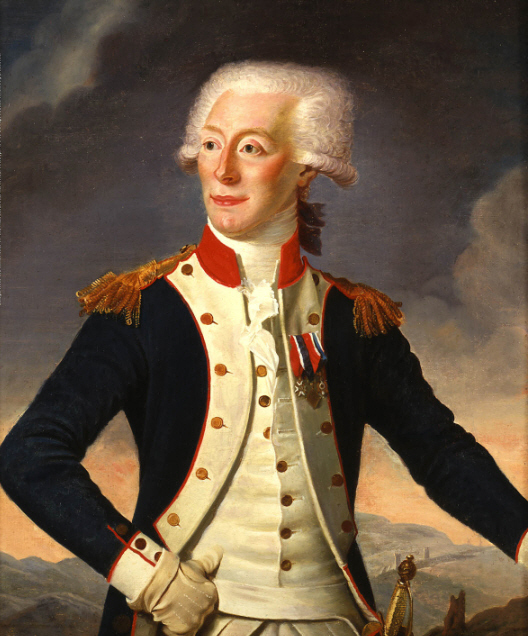 Marquis de Lafayette. Commissioned in Paris by Thomas Jefferson in 1790 for his gallery of American heroes, this Joseph Boze painting represents Marie-Joseph Paul Yves Roch Gilbert du Motier, the Marquis de Lafayette, at the pinnacle of his career. Restored by Darius Chase, 1844-45, and again by George Howorth, 1858. (28 Ji x 36.) Given by Mrs. J. W. Davis, Aug. 25, 1835 When President Jefferson died and his estate proved insolvent, his collection of paintings was exhibited in New York and at the Boston Athenaeum prior to a sale at Chester Harding’s Boston gallery in 1835. This portrait was purchased at that sale and presented to the Massachusetts Historical Society the same year. 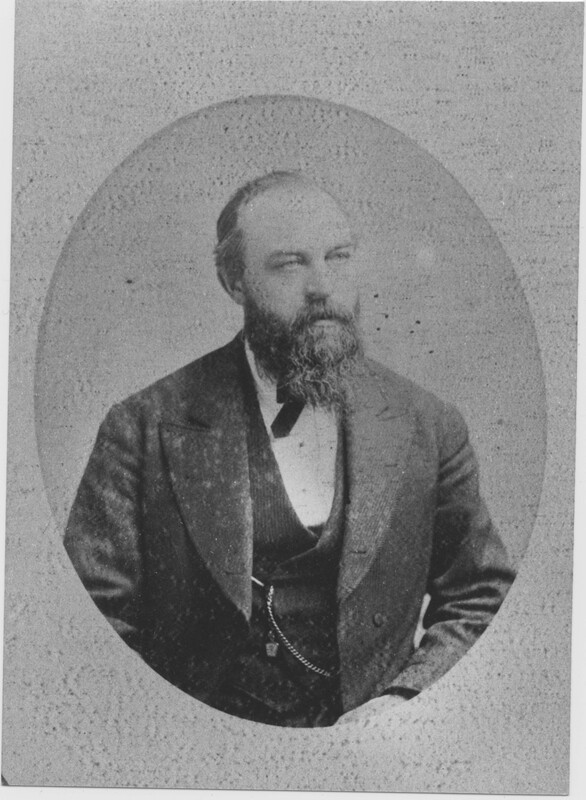 Peter Faneuil. Born at New Rochelle, N. Y., June 20, 1700. He gave Faneuil Hall to the town of Boston, Sept. 10, 1742. Died, March 3, 1742-3. Painted by Smibert. Restored by Darius Chase, 1845. Given by the heirs of Edward Jones, Oct. 29, 1835. A copy of this, painted by Henry Sargent, is in Faneuil Hall. Judah’s wife Emily Fish was born in 1814. Her parents were Daniel Fish (1795 – ) and Thankful Ewer (1790 – 1875). Emily died in 1895 and is buried in the Pine Grove Cemetery, West Harwich. Joseph’s wife Rose B Kelley was born 29 Sep 1821 in Harwich, Barnstable, Mass. Her parents were Joseph Kelley (1787 – 1869) and Didamia Chase (1790 – 1869). Rose died 4 Feb 1906 in Mattapoisett, Mass. Joseph chose the occupation of a farmer, in which he was prominent. In the 1860 census, Joseph and Rose were farming in Harwich with three children at home. Alfred’s wife Azubah Taylor was baptized 29 Dec 1819 in Chatham, Barnstable, Mass. Her parents were John Taylor and Hannah Harding. Azubah was a school teacher in Chatham, Mass when they married in 1845. Alfred and Azubah had six children born between 1846 and 1862. Azubah died 16 Nov 1899 – Leominster, Worcester, Mass. In the 1860 census, Alfred was a merchant living with Azubah, four children and an Irish domestic in Harwich. George was a sea captain. Erastus’ wife Sarah Abbey Trevett was born 29 Jun 1826 in Wiscassett, Lincoln, Maine. Her parents were Robert Trevett (1806 – ) and [__?__]. Erastus and Sarah had two sons born in 1859 Frank and Herbert. 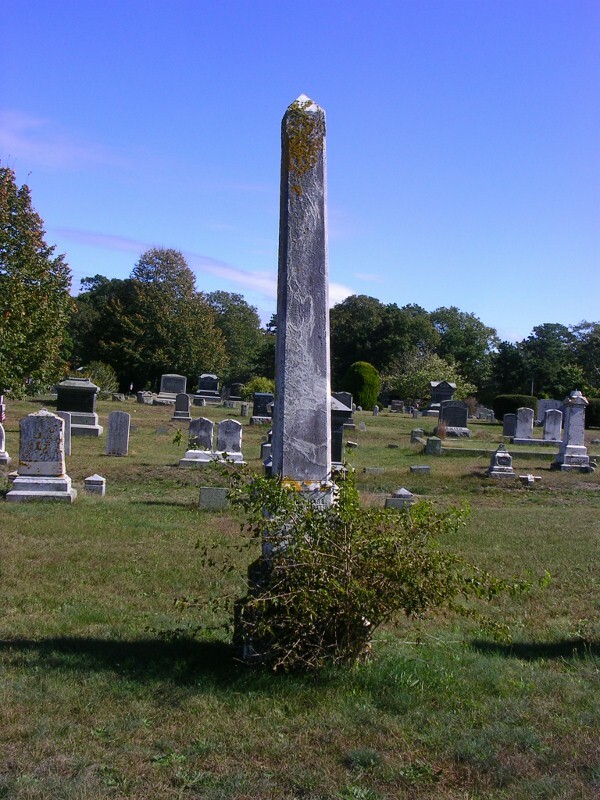 Sarah died 8 Feb 1895 in Harwich, Barnstable, Mass. Erastus was in mercantile business at West Harwich near Herring river—a continuation in part of his father’s business—having kept the post office twenty-four years and acted as deputy collector of internal revenue a period of four years. Erastus Chase House — West Harwich, Mass. Joshua originated the manufacturing firm known as the Union Paste Company of Boston, which is continued by his son-in-law, Anthony Kelley. The wonderful fish product called Chase’s Liquid Glue has become celebrated. James’ wife Esther Amanda Weston was born 8 May 1840 in Mass James and Esther had six children born between 1859 and 1875. James and Esther moved to California. In the 1860 census, he was a miner in Liberty, Klamath, California. Caleb’s wife Salome Salley Boyles was born in Apr 1839 in Maine. Salome died in Boston. Caleb was not content with the opportunities offered in the business of his ancestors, at the age of twenty-three went to Boston, where he entered the employ of Anderson, Sargent & Co., a leading wholesale dry-goods house. 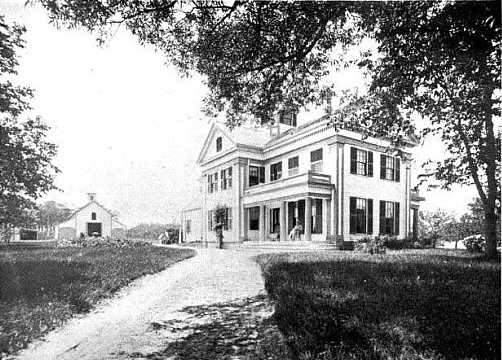 He traveled in the interests of this house on the Cape and in the West until September, 1859, when he connected himself with the grocery house of Claflin. Allison & Co., which connection was severed January 1, 1864, and soon after the firm of Carr, Chase & Raymond was formed. 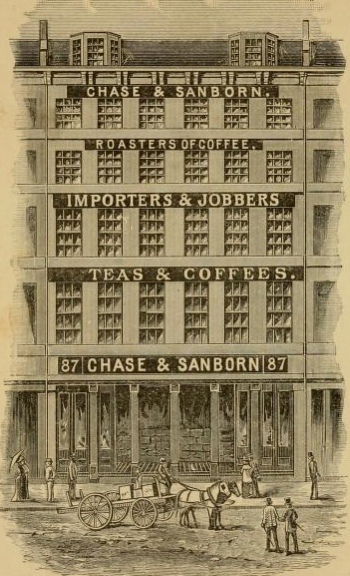 It 1871 the firm of Chase, Raymond & Ayer was organized, which existed until 1878, when the present firm of Chase & Sanborn commenced business. Mr. Chase is now the head of this house, than which save one other, there is no larger concern in the coffee trade in America. They have branch houses in Montreal and Chicago. He owns the homestead at West Harwich where his summer vacations are spent. The Chase and Sanborn Hour was the umbrella title for a series of US comedy and variety radio shows, usually airing Sundays on NBCf rom 8pm to 9pm during the years 1929 to 1948. With Chevalier returning to Paris, Eddie Cantor was chosen as his replacement and the new 60-minute program, The Chase and Sanborn Hour, was launched September 13, 1931, teaming Cantor with Rubinoff and announcer Jimmy Wallington. The show established Cantor as a leading comedian, and his scriptwriter, David Freedman, as “the Captain of Comedy.” When Jimmy Durante stepped in as a substitute for Cantor, making his first appearance on September 10, 1933, he was so successful that he was offered his own show. Then the world’s highest paid radio star, Cantor continued as The Chase and Sanborn Hour’s headliner until November 25, 1934. Chase and Sanborn found a gold mine with a wooden dummy when Edgar Bergen and Charlie McCarthy began an 11-year run, starting May 9, 1937. Initially this incarnation of the program also featured as regulars master of ceremonies Don Ameche, singers Dorothy Lamour and Nelson Eddy, and (for the first few weeks) comedian W.C. Fields, accompanied by a different guest star each week. Perhaps the most infamous of the latter was Mae West, whose appearance on the program of Dec 12, 1937 was highlighted with a sexually suggestive “Adam and Eve” sketch that caused a public outcry and resulted in West being banned from the radio airwaves for many years thereafter. Although the series ended December 26, 1948, it was followed by a compilation show on NBC, The Chase and Sanborn 100th Anniversary Show (November 15, 1964), assembled by writer Carroll Carroll and narrated by Bergen. This became an annual event with The Chase and Sanborn 101st Anniversary Show (November 14, 1965), a Fred Allen tribute, followed by The Chase and Sanborn 102nd Anniversary Show(November 13, 1966), which turned out to be the last of the series. 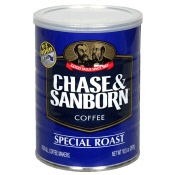 Chase & Sanborn Coffee is an American coffee brand created by the coffee roasting and tea and coffee importing company of the same name, established in 1862 in Boston,Massachusetts. It claims to be the first coffee company to pack and ship roasted coffee in sealed tins. When Standard Brands was formed in 1929, it acquired Chase & Sanborn, where it remained until 1981 when the company merged into Nabisco. Kraft Foods sold the brand to Sara Lee in 2002, and the Chase & Sanborn, Hills Bros., MJB, and Chock Full O’ Nuts brands were sold to Massimo Zanetti Beverage Group in 2006. This entry was posted in Artistic Representation, Line - Shaw, Sea Captain. Bookmark the permalink. Wow, 18 kids. They sure had a lot of kids back then. We think that 3 or 4 is a large family today.